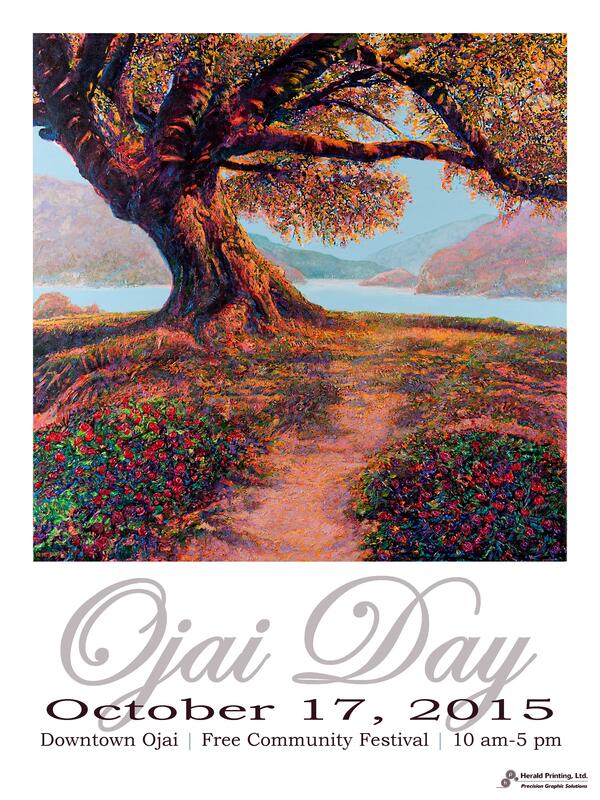 Ojai Day is proud to announce the winner of the Ojai Day 2015 Poster Art Contest, sponsored by Herald Printing. This year’s poster art, Lake Oak is done by local artist Kent Butler. Kent’s paintings have won numerous awards and are represented in private collections throughout the United States and we are honored to have his work serve as the Ojai Day 2015 poster. Oak trees are an iconic part of Ojai’s landscape. For generations the Ojai community has fought to preserve these majestic trees and worked to maintain the community forest. The oak tree in Kent Butler’s Lake Oak stands prominently in the foreground displaying the oak tree’s characteristic winding, curvy limbs creating a frame for the lake in the background. The committee appreciated the depth of field and peaceful yet vibrant colors. His attention to detail, coupled with his inherent interest in the Western motif and American art is evident in this piece. Born in Gunnison, Utah in 1944, Kent Butler developed a natural interest in nature as well as the American West. He can’t remember a time when he wasn’t drawing anything and everything that caught his eye, during his formative years. Kent began his formal art training at age 19 at the University of Utah. He then moved to Los Angeles, where he attended the Los Angeles Art Center College of Design. Kent left the Los Angeles area in 1982, and now lives in Ojai, California, a setting of great natural beauty, which Kent feels is the perfect place to focus and sharpen his talent, and to pursue an already highly successful career in the art world. Kent is known for his unique and expressive use of color, as well as his black and white drawings. His wide range of subjects and his variety in style is well known in contemporary circles. Posters will be available for purchase at City Hall, at the Recreation Department, and from the information booth on Ojai Day.